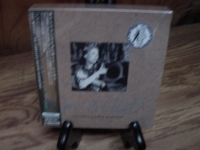 "Joni Mitchell OBI Box Set - 4 CDs"
JONI MITCHELL OBI MINI REPLICA BOX SET FACTORY SEALED. FOUR TITLES - DOG EAT DOG - WILD THINGS RUN FAST - CHALK MARK IN A RAIN STORM AND NIGHT RIDE HOME - Japanese OBI MINI REPLICA LP TITLES making a 4 CD Box Set- Japanese OBI MINI REPLICA BOX SET Japanese re-mastered Mini LP replica Limited Edition Collection Recorded from the finest Original Masters available. Each title Comes with anti-static sleeves similar to Vinyl LPs, Cardboard packaging exact to the original LP, Re-sealable plastic wrap cases for protection of each collectible and include extensive Liner Notes Booklet. Actual miniaturized version of the 12" LP in 4" CD version Special VERY RARE LIMITED EDITION BOX SET ONLY PRODUCED ON FUTURES FOR THIS ONE TIME PRESSING -- were only available in Japan. JONI MITCHELL OBI MINI REPLICA BOX SET FACTORY SEALED. FOUR TITLES - DOG EAT DOG - WILD THINGS RUN FAST - CHALK MARK IN A RAIN STORM AND NIGHT RIDE HOME Disc: 1 1. Chinese Cafe/Unchained Melody 2. Wild Things Run Fast 3. Ladies' Man 4. Moon at the Window 5. Solid Love 6. Be Cool 7. (You're So Square) Baby, I Don't Care 8. You Dream Flat Tires 9. Man to Man 10. Underneath the Streetlight 11. Love (Corinthians 11:13) 12. Two Grey Rooms [Unreleased Demo Version][*] Disc: 2 1. Good Friends 2. Fiction 3. Three Great Stimulants 4. Tax Free 5. Smokin' (Empty, Try Another) 6. Dog Eat Dog 7. Shiny Toys 8. Ethiopia 9. Impossible Dreamer 10. Lucky Girl 11. Good Friends [Unfinished Demo Version][#][*] Disc: 3 1. My Secret Place 2. Number One 3. Lakota 4. Tea Leaf Prophecy 5. Dancin' Clown 6. Cool Water 7. Beat of Black Wings 8. Snakes and Ladders 9. Reoccurring Dream 10. Bird That Whistles Disc: 4 1. Night Ride Home 2. Passion Play (When All the Slaves Are Free) 3. Cherokee Louise 4. Windfall (Everything for Nothing) 5. Slouching Towards Bethlehem 6. Come in from the Cold 7. Nothing Can Be Done 8. Only Joy in Town 9. Ray's Dad's Cadillac 10. Two Grey Rooms 11. It's All over Now, Baby Blue [#][*][Demo Version] These are Japanese digitally re-mastered Mini LP replica CDs (the OBI Edition). This Limited Edition Collection has only VERY FEW made world-wide and are immediately Out of Print. Recorded from the finest Original Masters available. Comes with anti-static sleeves similar to Vinyl LPs, Cardboard packaging like an LP, includes extensive Liner Notes Booklet. Actual miniaturized version of the 12inch LP in 4inch CD version.